Gmail Notifier password recovery - instantly decrypt and decode your Gmail password! It is easy to check whether your Gmail password is saved by Gmail Notifier and therefore can be retrieved from the system. If you see Cannot connect to your mailbox. 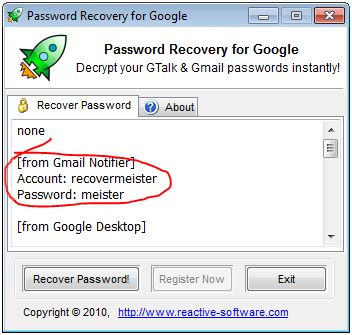 Invalid user name or password then your password is not saved on your computer and therefore can not be recovered from the system. If you see Offline then you need to connect to the internet and check the message again. If you confirmed that your Gmail Notifier password is saved in the system you can use our Gmail Notifier password finder tool to recover it. The installation and recovery process is described in the next section. You can now open your Gmail account and change Gmail password to something that can be easier for you to remember but not too easy to guess for the hackers! ).